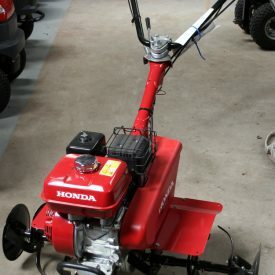 The Honda FE500 tiller is the logical starting point for the commercial or serious gardener. It is the ideal machine for those users requiring extra durability and power. Extra-wide working width of 966mm for efficient work on large plots of medium tilth. Deadman's handle for added safety. Y-shaped loop handles adjust to your height for maximum comfort.